During the coming period Almoz will continue to serve as a spokesperson for the IDF while assuming position as head of IDF human resources. Brigadier General Motti Almoz was promoted today (Thursday) to the rank of Major General and appointed to head the IDF Manpower Directorate at a ceremony held in the Chief of Staff's bureau at the Kirya complex in Tel Aviv, attended by Defense Minister Liberman, Chief of Staff Eizenkot and members of the General Staff Forum. 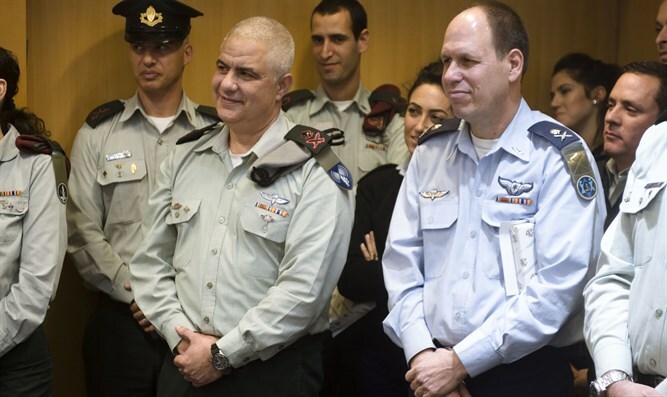 Almoz, who is now the IDF spokesman, will replace the outgoing personnel head, Chagai Topolonski, who served in this position for two years and three months and will finish his military service after 33 years. Topolonski resigned from the army after a military computer was stolen from his home in the south. During the coming period Almoz will continue to serve as army spokesman in addition to his role as head of human resources. Defense Minister Liberman said that "the responsibility of the head of the Manpower Directorate is a huge responsibility. I'm sure you can accomplish this task as easily as you fulfilled all prior tasks and I wish you both luck in the new paths you are undertaking." Chief of Staff Eizenkot said at the ceremony, "Moti is accepting responsibility and command of our most important resource, the soldiers. Motti brings extensive combat service, 10 years as a Colonel in three key roles. In the past three years we saw him demonstrate his ability as an exceptional man who has earned broad loyalty and esteem ... I am convinced Moti is the right man in the right place and the right time to accept the scepter from Chagai with a steady hand and continue the race of responsibility and duty of each of us to contribute the most he can to make this a better army. I wish you every success on behalf of the Forum."